Four of the five championship classes were dominated by just one rider at the South Waikato Motorcycle Club’s circuit at Amisfield on Saturday night, although, in each case, results were never really certain until the final laps, with thrilling cut-and-thrust racing a feature of the night. 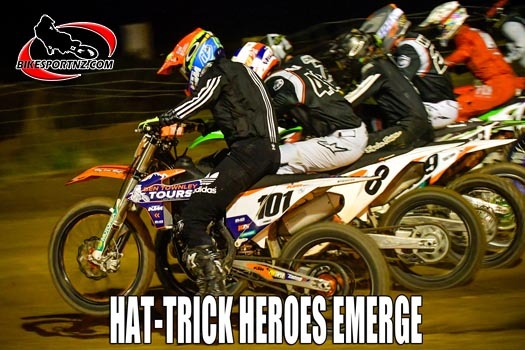 Oropi’s Ben Townley (SX1, open class), Mount Maunganui’s Josiah Natzke (SX2, 250cc), Ohaupo’s Carlin Hedley (SX Lites, 125cc) and Rangiora’s Korban Paget (Junior 250) each recorded a hat-trick of wins in their respective classes, perhaps setting the tone for how the championships might wrap up at the second and final round at Winton, near Invercargill, in two weeks’ time. In the remaining championship class, the Junior Lites, it had looked like Hamilton’s Nicholas Westgate would take charge after he won the first two of three races on the night, but then visiting Czech Republic rider Julius Mikula won the final race, while Westgate managed only seventh, causing something of a boil-over. Westgate’s brother, Dylan Westgate, finished with a 2-3-2 score-card on the night and this was enough for him to end up level on points at the top, only losing out to his sibling rival on a count-back, while a 3-2-4 score-card from Rongotea’s Rhys Jillings earned him the third podium spot, just ahead of Mikula. Nelson’s Reece Walker earned the third spot on the night’s SX1 podium with a solid 3-2-3 score-card. Natzke had been the best-performed of the Kiwi riders at Mt Smart Stadium and so he therefore arrived at Tokoroa with 17 points already in the bank, while Waitakere’s Ethan Martens turned up with 15 points to his credit and Te Puke’s Logan Blackburn had 13. Natzke’s three wins from three starts at Tokoroa then pushed his advantage out from three points to 15 over Martens, who managed 3-3-2 at Tokoroa, while Mangakino’s Maximus Purvis captured the third podium position with a 4-2-3 score-card on Saturday night. “About 18 months ago we had a meeting in Taupo and came up with a strategic plan to build a pathway for the riders, rebuilding the juniors, so that they feed into the seniors in the future and what we saw here at Tokoroa absolutely kick-started that.